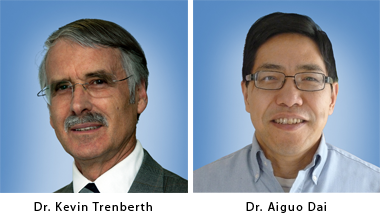 The team of Dr. Kevin Trenberth and Dr. Aiguo Dai (National Center for Atmospheric Research, USA). The prize is awarded to this team for ground-breaking work that provides a powerful estimate of the effects of climate change on the global hydrological cycle, with a clear explanation of the global water budget. If we are going to talk about hydrology in the 21st century, and the challenges hydrologists face, clearly the overwhelming challenge is to understand hydrologic variability, and the likely impact on hydrology of anticipated climate change. The team has made a unique contribution through the investigation of climate variability and trends in the past, and through the use of models and other creative efforts to reconstruct river discharge into the oceans across the planet for almost 1000 river basins. They use climate models to understand likely changes in the future and the uncertainty associated with those predictions, and explain their findings using such popular indicates as the Palmer drought index. As a result, they have provided an exemplary account of the global water budget that is being used in textbooks and encyclopedias. They have made pioneering contributions to understanding the past with real data, and evaluating the future prospects within the context of what we know of the global climate and hydrology. They have provided a much better understanding of hydrologic responses to climate change, which in turn will provide tremendous guidance for future planning. 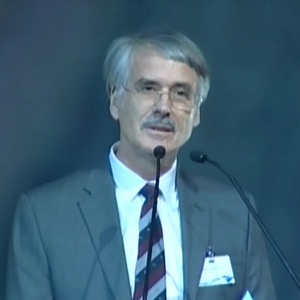 Dr. Kevin E. Trenberth is head of the Climate Analysis Section at the National Center for Atmospheric Research (USA). Sc.D. 1972; Massachusetts Institute of Technology, Cambridge, Massachusetts. B.Sc. (HONS First Class) 1966; University of Canterbury, Christchurch, New Zealand. 2007: Nobel Laureate (shared) for Nobel Peace Prize 2007 (as part of IPCC). 2007: American Geophysical Union Editor’s citation for excellence in reviewing. 2003: NCAR Distinguished Achievement Award. 2000: Jule G. Charney award, American Meteorological Society. 1989: American Meteorological Society Editors Award (J. Climate). 2006: Fellow American Geophysical Union. 1995: Honorary Fellow Royal Society of New Zealand. 1994: Fellow American Association for the Advancement of Science. 1985: Fellow American Meteorological Society. Dr. Aiguo Dai is Associate Professor of Atmospheric Science, Department of Atmospheric and Environmental Sciences, University at Albany, SUNY. Ph.D. 1996; Columbia University, Atmospheric Science. M.S. 1988; Institute of Atmospheric Physics, Chinese Academy of Sciences, Atmospheric Physics. B.S., 1985; Nanjing University (China), Atmospheric Science. 1997-1998: NOAA Postdoctoral Fellowship in Climate and Global Change. 1992: Natural Science Award of the Chinese Academy of Sciences. My colleague Dr Aiguo Dai and I are deeply honored to receive the prestigious international Prince Sultan Bin Abdulaziz for Water – The Surface Water Prize. Our work on water has focused on understanding the hydrological cycle and its changes over time. We started from a global perspective where the water cycle is closely tied to the sun’s energy and the availability of water. The latter is not an issue over the 70% of the globe that makes up the oceans. So the movement of water around in the atmosphere is critical. It gives rise to precipitation, runoff, river flows, evaporation and storage as components of the water cycle that we have studied. We believe that we have made a unique contribution through investigations of climate variability and trends in the past, and through the use of models and other efforts to reconstruct river discharge into the oceans across the planet for over 900 river basins. We have expounded on the use of various drought indices and their links to soil moisture and river flow, and we have explored global atmospheric analyses of winds, water vapor and energy, and used them to define the hydrological cycle and its variations. Our small group functioned within a major climate modeling center, and at times we have been a thorn in the side of modelers when we remind them of how nature really works. Water is an amazing substance. It is really the air conditioner of the planet as its presence provides for evaporative cooling. It comes in different phases as vapor, liquid, or solid and transforms before our eyes into wondrous complex clouds of all shapes and sizes, but it can also come as fierce storms, with strong winds, lightning and hail, and storm surges, threatening loss of life. As the planet warms with climate change, our work has shown how the risk of extremes increases: both drought, and heavy rains and floods. It has been said “Water is irreplaceable and non-substitutable. It is more than just another natural resource.” “Water is life”. In semi arid regions, including Saudi Arabia, water is recognized as a very valuable commodity. In many places around the world, water is taken for granted – until there is a drought. With burgeoning populations and increasing demand for potable water, along with climate variability and change, there are major challenges before us and further down the road for managing water. The prospects for increasing droughts and longer dry spells, along with more intense rainfall events, means that we must save water from times we have excesses for times when we do not have enough. We are privileged to have been able to do a great deal of work on the hydrological cycle. But what is dismaying is the lack of follow through by many policy makers when trouble arises. As portrayed by the Drought Mitigation Center in the U.S., the “hydro-illogical cycle” depicts how drought, as a slow-moving natural disaster, tends to emerge to a level of awareness, then growing concern, and then further intensify until people can no longer ignore it or wish it away, perhaps to a point of panic—until it rains again. Immediately apathy sets in until the next crisis. As chairman of the Global Energy and Water Exchanges (GEWEX) scientific steering group, under the World Climate Research Programme, I have been engaged in developing Grand Science Questions concerning international water research directions over the next 5 to 10 years to enable us to better understand and manage this critical resource of water availability and quality. GEWEX helps lead and coordinate the research to make the whole greater than the sum of its parts. However, it does require funding and recognition for the individual parts, and the Prize helps raise the visibility of the needs and the potential. There are some wonderful prospects for improved information from satellite sensors and in situ observations that we believe will lead to improved modeling of climate and hydrology, thereby enabling better information for decision makers at all levels. It is an exciting endeavor. It is exciting because it is a challenging science problem but also because it is societally relevant and important. The Prince Sultan Bin Abdulaziz International Prize for Water is a wonderful reward that provides visibility to the important problems associated with water and it promotes research and engineering into innovative solutions. We applaud and thank the organizers of the Prince Sultan Bin Abdulaziz International Prize for Water, the Prize Council, and His Royal Majesty Crown Prince Sultan Bin Abdulaziz himself, for this extraordinary recognition for our work. 1. Trenberth, K. E., L. Smith, T. Qian, A. Dai and J. Fasullo, 2007: Estimates of the global water budget and its annual cycle using observational and model data. Journal of Hydrometeorology, 8, 758-769. 2. Trenberth, K. E., and A. Dai, 2007: Effects of Mount Pinatubo volcanic eruption on the hydrological cycle as an analog of geoengineering. Geophysical Research Letters, 34, L15702, doi:10.1029/2007GL030524. 3. Dai, A., T. Qian, K. E. Trenberth, and J. D Milliman, 2009: Changes in continental freshwater discharge from 1948-2004. Journal of Climate, 22, 2773-2791. 4. Trenberth, K. E., 2011: Changes in precipitation with climate change. Climate Research, 47, 123-138, doi:10.3354/cr00953. 5. Dai, A., 2011: Drought under global warming: A review. Wiley Interdisciplinary Reviews: Climate Change, DOI: 10.1002/wcc.81.